My grandson Dayan is a huge Dr Who fan. He’s been talking to me about this BBC series, with enthusiasm, for a long time. While in Scotland, I had my picture taken in front of a blue police box, because it is an important prop in the Dr Who series. I knew Dayan would love the pic. I have been intending to start on the series, so my grandson and I can discuss the story and share in that adventure. Tonight, for my first, I did indeed jump on the Dr Who bandwagon with Season One, Episode One, called “Rose”. 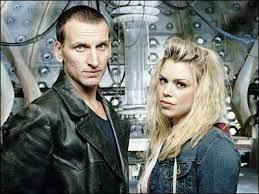 Dr Who Season One stars Christopher Eccleston as the famous Time Lord and Billie Piper as his traveling companion, Rose Tyler. This British sci-fi series began on March 26, 2005 and ran for 13 episodes. This program was a return to television. The first Dr Who series ran from 1963 – 1989. Which means, the Dr Who in season one of the most recent version is the Ninth Dr Who. This iconic series depicts the adventures of the Time Lord who is a time traveling humanoid alien. He explores the universe in his ship called the TARDIS, with the exterior appearing as a blue police box, which was a common sight in 1960’s Britain. Accompanied by a succession of companions, Dr Who encounters a variety of foes while working to save civilizations, including Earth’s. Twelve actors, so far, have appeared over the years as Dr Who. The transition from actor to actor is a part of the storyline, a regeneration into a new incarnation, explained as a part of the life process of Time Lords. The Doctor takes on a new body and a somewhat different personality after incurring an injury that would be fatal. The actors’ portrayals are all considered to be showcasing different aspects of the same personality. I perhaps should have begun with the original series that premiered in 1963. However, I decided to jump in with the newer series that began in 2005. Episode one begins with an introduction of Rose, who meets the mysterious Dr in the basement of the clothing store where she is an employee. Rose is being chased, impossibly, by store mannequins. I found this to be very creepy….who hasn’t cast a quick second glance toward a mannequin, making sure it didn’t just move….and reminded myself this was a SCI-FI series, after all! Little by little, throughout the first episode, information about Dr Who is revealed. Very little, though. For those who were familiar with Dr Who and welcomed the show’s return, it was a recap. For those new to the storyline, it was enough to peak interest and bring viewers back for more. At the end of this monumental first foray back into the franchise, Rose joins Dr Who as his traveling companion and cohort, and off they go. I enjoyed the episode and look forward to watching all of Season One this week. I love sci-fi, having grown up on Star Trek. I loyally followed that series through all of its voyages of the Starship Enterprise, up to and including the new movies that have started the storyline over. I will follow this series as well, catching up to the current season, and my grandson’s knowledge. Then, at last, Dayan and I can have great conversations about Dr Who, because I will know what I am talking about!